only for its beautiful lines and luxurious interior, but also its superb driving dynamics. 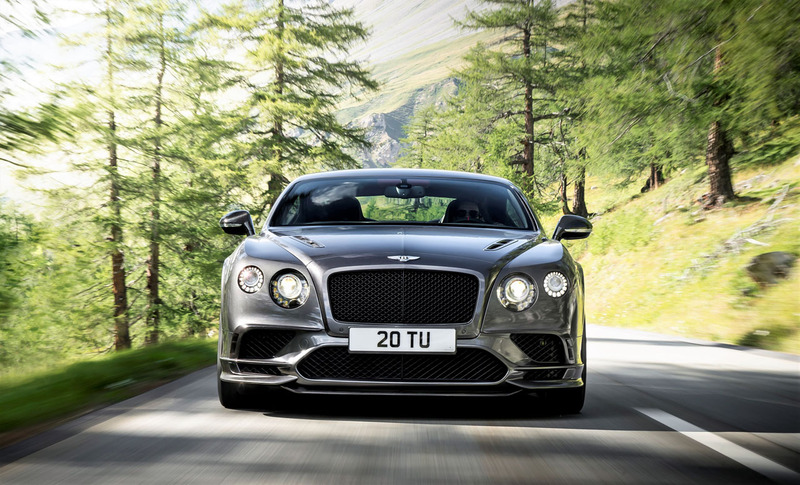 Whether equipped with its base 500 horsepower twin-turbocharged 4.0-litre V8 good for 4.8 seconds from standstill to 100km/h and a 305 km/h (190 mph) top speed, the 520 horsepower version of the same engine found in the V8 S that’s capable of a 4.5-second sprint to 100km/h and 309 km/h (192 mph) terminal velocity, the 582 horsepower twin-turbocharged 6.0-litre W12-powered GT that achieves identical straight-line performance albeit a higher top speed of 319 km/h (198 mph), or the 633 horsepower version of that more potent W12 that’s capable of 4.1 seconds to 100km/h and a 332-km/h (206-mph) top speed, it’s a four-seat sport luxury coupe that few rivals come close to matching. 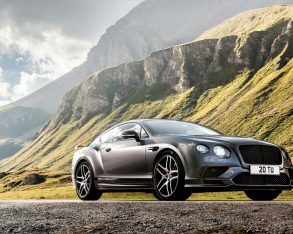 than give those challengers opportunity to catch up, Bentley now offers a new top-line Continental Supersports with a shocking 700-horsepower 12-cylinder engine capable of blasting the 2,750-kilo (6,063-lb) super coupe to 100 km/h in just 3.5 seconds before attaining a top speed of 336 km/h (209 mph)! 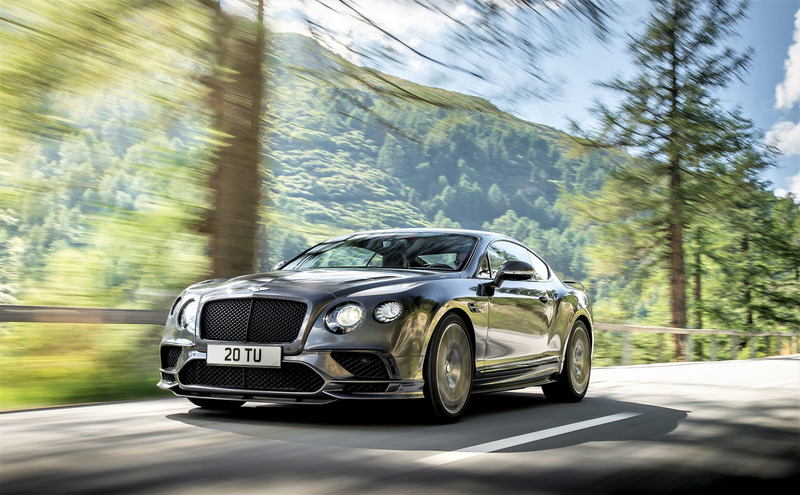 That’s even quicker off the line and ultimately faster than the previous benchmark Continental GT3-R, that model inspired by Bentley’s GT3 endurance racing car; the new Supersports the most powerful Bentley ever offered, its four wheels motivated by an otherworldly 750 lb-ft of torque. 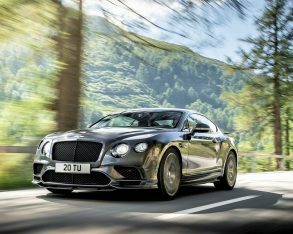 This not only makes it the quickest Bentley to ever sprint to 100km/h, but also the world’s fastest four-seat luxury vehicle, period. 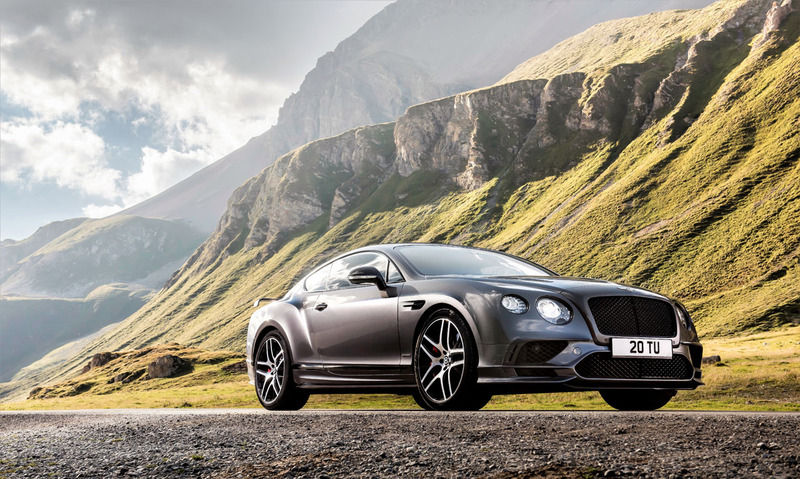 more, unlike the GT3-R, the Continental Supersports is available in both two-door hardtop and convertible body styles, the soft-top version now the fastest four-seat convertible in the world at 3.9 seconds to 100km/h with a top speed of 330 km/h (205 mph). 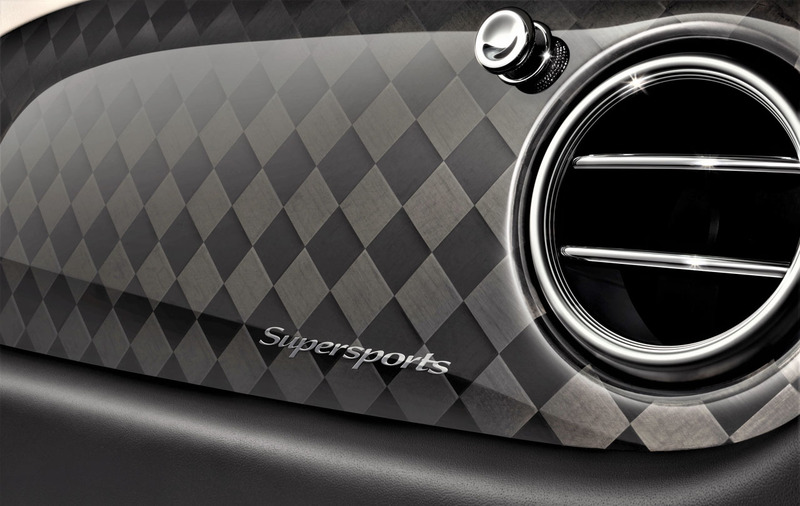 fade under extreme use, make sure the Supersports can be brought to a stop under quick control. 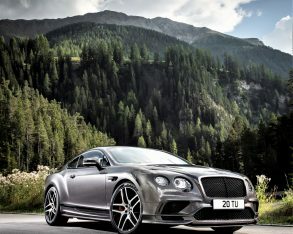 Gorgeous 21-inch forged alloy wheels (on 275/35ZR21 performance tires) are 20 kilos (44 lbs) lighter than standard GT rims, while Bentley can shave another five kilograms (11 lbs) from the Supersports’ overall mass by adding an available titanium exhaust system, although it should be noted its standard exhaust system is already upgraded for freer breathing and delivers a “rifle-fire crackle” backpressure note upon downshifts, says Bentley. 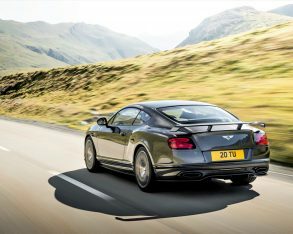 Speaking of weight, it shouldn’t be overlooked that the new Supersports is already the lightest-ever version of the current Continental GT, not to mention lighter than the previous 2009 Supersports model. paddle shifters, plus continuous all-wheel drive with a 40:60 rear bias that adds more rear-drive feel, while it rides on a four-link double wishbone front and trapezoidal multi-link rear computer-controlled self-leveling air suspension with anti-roll bars at both ends, featuring dynamic performance-tuned continuous damping control. 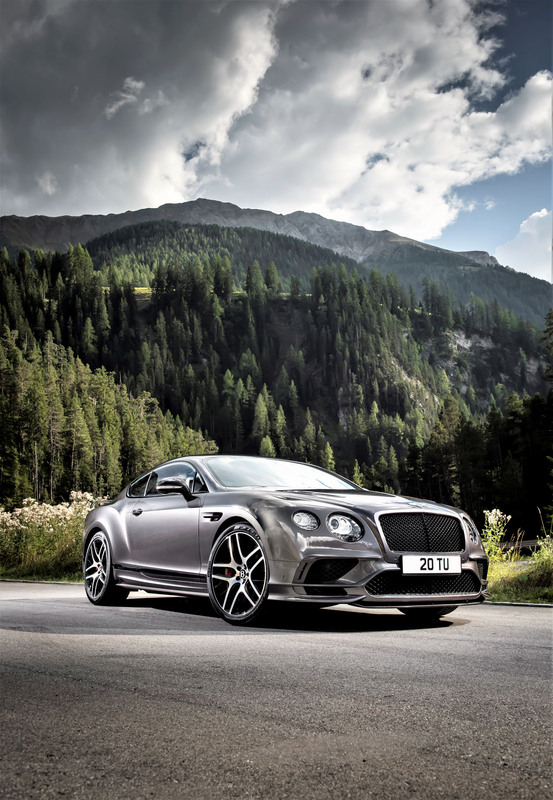 This suspension is not only designed to carve up a circuitous two-lane canyon road with levels of speed and control nearing the likes of mid-engine supercars, but as importantly to Bentley and its clientele, deliver a comfortable, compliant ride. 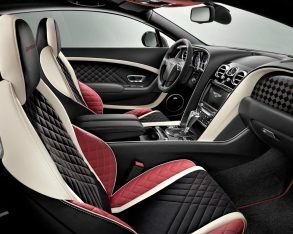 Supersports styling details include unique front and rear bumpers, both incorporating a carbon-fibre splitter and diffuser, while hood vents, gloss-black front wing vents, new side sill extensions, new gloss-black, rifled exhaust tailpipes, plus dark-tint headlamps and taillights add to the modified look. 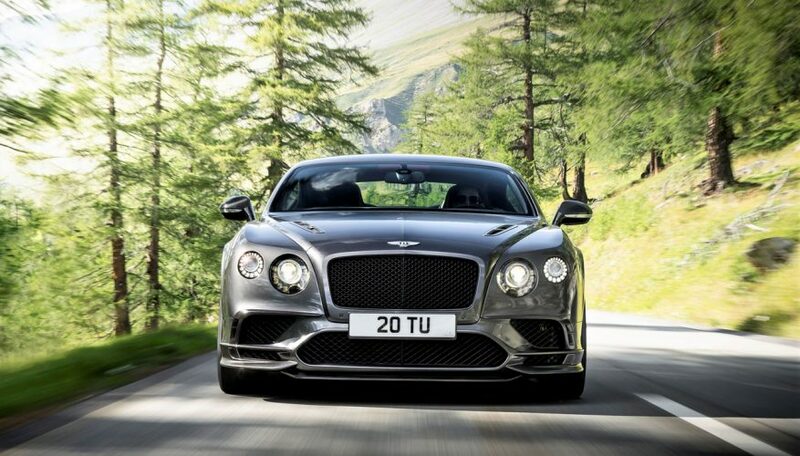 Bentley finishes off the appearance upgrade by replacing trim that would otherwise be chromed, such as the front grilles, lights, rear bumper, door handles, and window surrounds, with black-finished “brightware”. 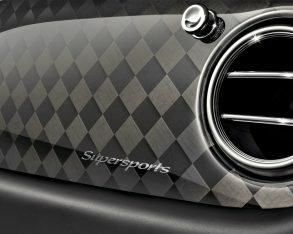 Supersports options include an “aerodynamically balanced” rear spoiler and front splitter combination for the coupe, special Supersports badging, new black and bright machined finishes for the 21-inch alloys, and available side decals, while those wanting a little less weight and more flash under the hood can opt for a gloss-finished, Supersports-branded carbon-fibre engine cover. 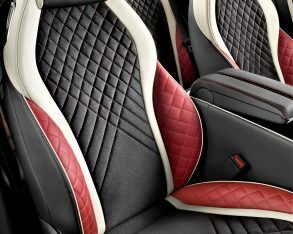 inserts and door panel inserts receive a new diamond-quilted design in suede-like Alcantara, while exclusive checkered Supersports carbon-fibre fascia panels are offered alongside ten existing veneers and technical trim finishes. 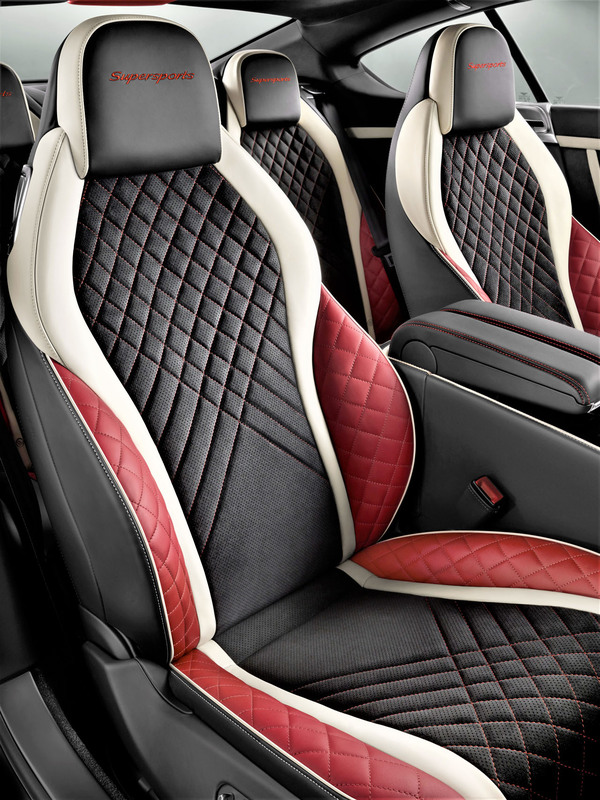 Completing the cabin design is Supersports emblem stitching, a bespoke Supersports steering wheel, and an exclusive gear lever, the latter two components incorporating Alcantara accents. 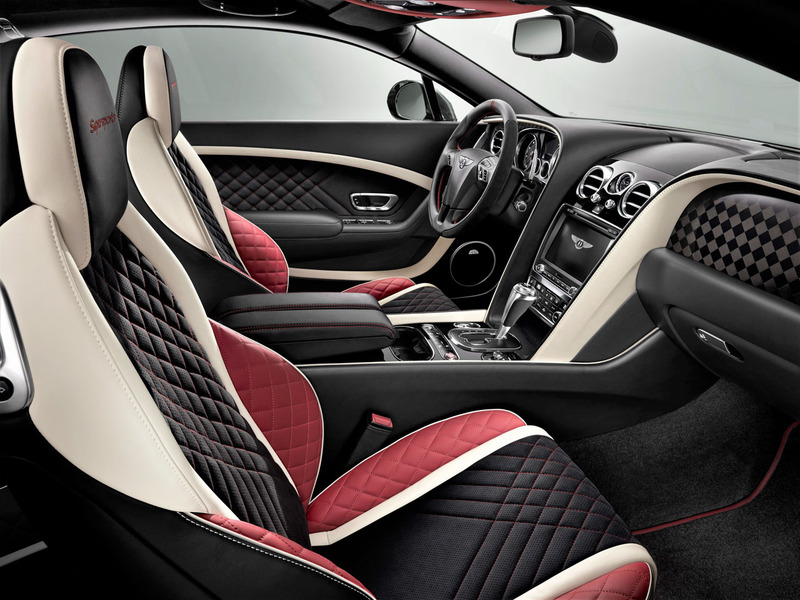 If yet more personalization is required, an ‘X Specification’ pack offers eight duo-tone paint treatments plus carbon-fibre door mirrors and heel plates. The previously noted titanium exhaust option is included, as are carbon-fibre finished interior side panels, the previously noted carbon-fibre engine cover, and a gloss black finish to the forged alloy wheels. 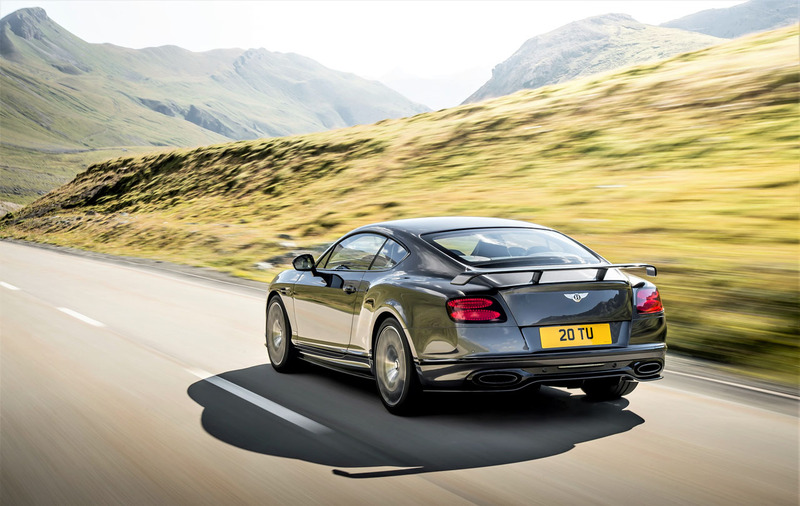 As with every Bentley model, the Continental Supersports can be further customized to individual tastes by the automaker’s Mulliner division, bespoke coach building at its finest.